The instant #1 New York Times bestseller! Stephen King delivers an “outstanding” (USA TODAY) collection of stories, featuring revelatory autobiographical comments on when, why, and how he came to write (or rewrite) each story. Since Nightshift, published many years ago, Stephen King has dazzled an entire generation of readers with his genius as a prominent writer of short fiction. Now in his latest collection, he once again assembles a generous array of unforgettable, tantalizing tales—including those that, until recently, have never been published in a book (such as the story “Cookie Jar,” which is exclusive to this edition). There are thrilling connections between these works—themes of mortality, the afterlife, guilt, and what we would do differently if we could see into the future or correct the mistakes of the past. 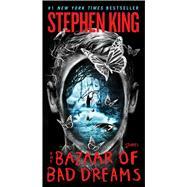 Magnificent, eerie, and utterly compelling, The Bazaar of Bad Dreams is one of Stephen King’s finest gifts to readers everywhere—a master storyteller at his very best.